Holocaust Memorial (Holocaust-Mahnmal) in Berlin. 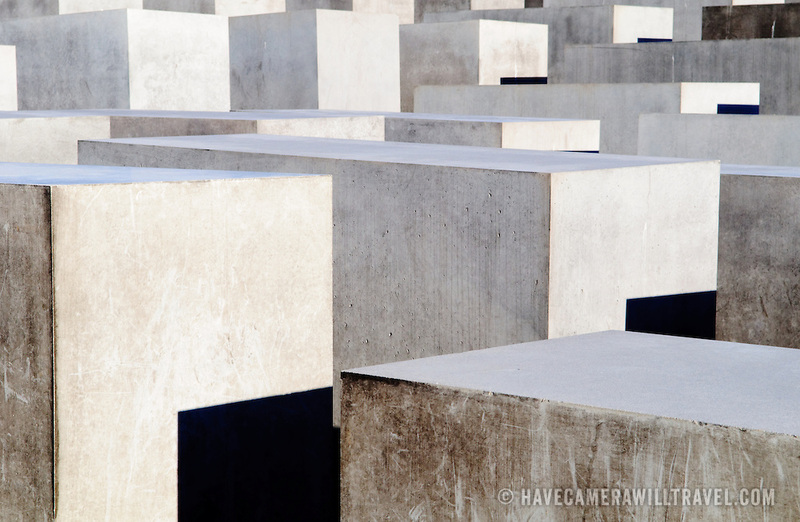 The Memorial to the Murdered Jews of Europe (German: Denkmal für die ermordeten Juden Europas), also known as the Holocaust Memorial (German: Holocaust-Mahnmal), is a memorial in Berlin to the Jewish victims of the Holocaust, designed by architect Peter Eisenman and engineer Buro Happold. It consists of a 19,000 square meter (4.7 acre) site covered with 2,711 concrete slabs or "stelae", arranged in a grid pattern on a sloping field. The stelae are 2.38m (7.8') long, 0.95m (3' 1.5") wide and vary in height from 0.2 m to 4.8m (8" to 15'9"). According to Eisenman's project text, the stelae are designed to produce an uneasy, confusing atmosphere, and the whole sculpture aims to represent a supposedly ordered system that has lost touch with human reason. A 2005 copy of the Foundation for the Memorial's official English tourist pamphlet, however, states that the design represents a radical approach to the traditional concept of a memorial, partly because Eisenman did not use any symbolism. An attached underground "Place of Information" (German: Ort der Information) holds the names of all known Jewish Holocaust victims, obtained from the Israeli museum Yad Vashem...Building began on April 1, 2003 and was finished on December 15, 2004. It was inaugurated on May 10, 2005, sixty years after the end of World War II, and opened to the public on May 12 of the same year. It is located one block south of the Brandenburg Gate, in the Friedrichstadt neighborhood. The cost of construction was approximately EUR25 million.